South Stack Cliffs First, fantastic visit to South Stack. A quick test to see if this posts! 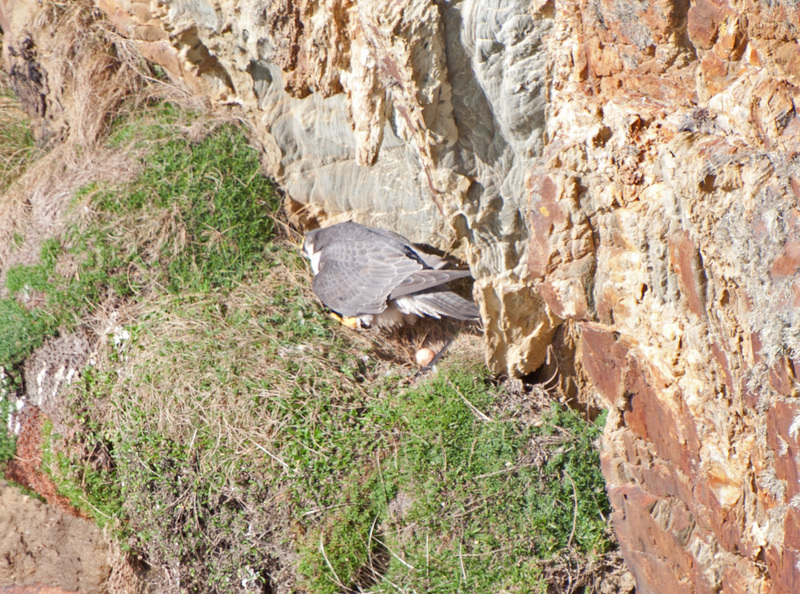 I initially thought it was a peregrine but it turned out to be a hobby. Whoops! The real surprise came when it became evident that choughs are not remotely camera shy! I was in utter corvid heaven! I've never seen these birds before and to just see them naturally doing their thing as I was wildly snapping away was brilliant. There were a number of jackdaws about as well. This is the South Stack lighthouse. Apparently there are more than 400 steps to get to it so it was a no-no for Limpy. Choughs are absolutely joyful in flight. I couldn't get enough of watching them. This one is giving me a look! I love the iridescence on its feathers - more subtle than a magpie but still beautiful. A herring gull demonstrating its usual expressiveness on Ellin's Tower. I love seeing sailing boats - they look so elegant. This just looked cold, wet and hard work! The regular ferry to Dublin. What's the betting that's how the hooded crow turned up in Holyhead? These two were very together. Even as they flew off! A fleeing great black-backed gull. The Godfather at Felixstowe Ferry used to do this to me until he learned that I was harmless. This chough landed quite close to me. I was more than happy to watch it! It looked as though it was investigating the tissue. After it flew off I picked the tissue up - I hate seeing litter about, especially on the coast. I'm not great at fungi but I'm pretty sure these are parasol mushrooms. Finishing with a final, beautiful chough on the visitor centre feeder! I have absolutely got to come back here!! Clare, It is great that you and Limpy made it to South Stack and saw the wonderful Choughs! I've not seen one on a feeder, but I suppose it stands to reason since our Jays, Magpies and Jackdaws take food from our suet log feeders and the Jays take suet pellets. Did you hear the Choughs chattering to each other? We were quite taken with their cheery chatter when we saw a pair on the Isle of Man a few years ago. Yes, we did hear them - they don't sound unlike jackdaws. Great report Clare & your pics are wonderful to see! You kept that visit quiet Clare, you could have had a brew on passing, and I could have followed you both to get your expertise on how to take such fabulous photos!! Lovely pics of the Choughs, and getting a Hobby too, well done. Glad you saw the climber on the cliffs, scared me to death last time! Wendy I've been told I have flagged your post (: Sorry it, of course, wasn't intended. I'm so sorry, Gaynor, I should have said - I just didn't think about it. The photography is mostly practice, along with a few really good photographers at Minsmere who are always willing to explain bits and bobs in plain English. We also joined our local photographic society this year, and that's been really useful as well. Fantastic, Andy! That must have been amazing. That's OK Clare, catch you next time maybe. AndyC that was a case of being in the right place at the right time, fantastic to be able to have followed it up too.